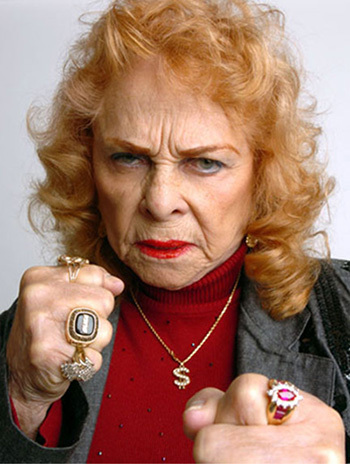 Mary Lillian Ellison (1923–2007), better known by her ring name The Fabulous Moolah, was the champion American woman wrestler. Mary began her career in the ring at a tender age as Slave Girl Moolah, the 'prop' of a wrestler called Elephant Boy. Her ring name originated as a nickname, from her announcement that she intended to wrestle for 'all the moolah [money] I can get my hands on.' She seems to have succeeded, since in the 1970s she was claiming to earn more than $100,000 a year. She began her career working with promoter Billy Wolfe and his wife, wrestler and trainer Mildred Burke, as well as working alongside professional wrestler ‘Nature Boy’ Buddy Rogers. She won the NWA World Women's Championship in 1956 and was the most prominent holder of the title for approximately the next thirty years. In the 1980s, she joined the World Wrestling Federation (WWF) as part of the Rock 'n' Wrestling Connection storyline, feuding with Cyndi Lauper and Wendi Richter, the latter of whom defeated her for the WWF Women's Championship in 1984. Ellison was marketed by the WWF (later World Wrestling Entertainment, WWE) as holding the record for the longest title reign by any athlete in any professional sport. According to WWE, she was also the first WWF Women's Champion and held the title a total of four times. In addition, Ellison was a prominent trainer and promoter in woman’s professional wrestling. In the 1990s, she returned to the WWF in a comedic role with long-time friend Mae Young. Ellison was inducted into the WWE Hall of Fame in 1995 and became the oldest champion in the history of professional wrestling when she won the WWF Women’s Championship at age 76, in 1999. In 2010, WWE recognized her as the 27th best wrestler ever.